We’ve covered shacking up with your significant other a few times here on the site… From 10 questions to ask yourself before moving in together (a must-read, in my opinion) to 5 decorating tips for couples who live together. After moving in with my own significant other about four months ago, I realized that this topic definitely deserved a follow-up post. What does one actually learn when they shack up with their sweetheart? I’ve been giving a lot of thought lately… After all, it’s a major life milestone to move in with your special person. It’s one of the most exciting time in one’s life, with a few learning moments (and hopefully a lot of laughs that come with them!) along the way. So today I wanted to share five things I’ve learned since we moved in together. The two of us are actually very compatible on this topic, but we still have slight differences… While I might throw my jacket and jeans on the bench at the end of our bed after a long day and think that I’m being “tidy,” my fiancé tends to hang his garments up neatly in his closet the minute he changes clothes. However, I can’t relax if I know there are dirty dishes in the sink after dinnertime, whereas he likes to decompress with dessert and a movie on the couch before beginning the clean-up routine. No one is right or wrong here, but I’ve learned that we each have our own ideas of clean and tidy. The takeaway is that it’s important to respect each other’s space and know that we’re both doing our best to keep our home put-together in the midst of long workdays and busy schedules. Whenever one of us is really slacking on the clean routine, we’ll speak up. But for the most part, it’s all about acceptance and pitching in equally to help tidy up. 2. The little things go a long way. When we were in the courting phase of our relationship, it was the grand gestures that had me smitten. But now that we’ve settled into our life together and are living under one roof, I’ve come to realize that it’s the little things that really touch my heart and make my day. The other evening I was driving through three hours of rush hour traffic on the 405 to get home after a long day of meetings. I was cranky, to say the least. Months before, when we moved in together, we had agreed upon sharing the cooking duties in our home, but when I walked in the door that night, my fiancé had not only done the cooking, but had made sure my dinner was hot and on the table the minute I got home. It was the fact that he knew that serving food right out of the oven (instead of the easy route—reheating it in the microwave) would taste much better after a long day and a brutal commute. This little touch went such a long way. We’ve both learned the importance of putting each other first and taking that extra step to brighten one another’s days, even if it’s as simple as having a warm plate of food on the table. It felt like the minute we got engaged we became a solid “we.” Now, I don’t mean that we had never used this plural pronoun before my fiancé popped the question. 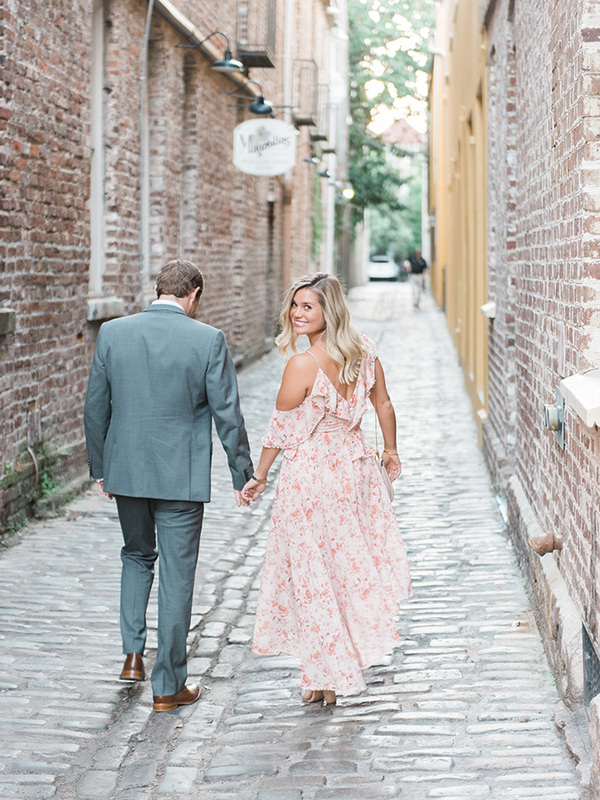 But, after getting engaged, there was more of an unspoken sense that we had officially become solidified teammates—that we were really “in it” together. This became even stronger when we moved in together. When we were living separately, our lives just naturally had a bit more independence and separation, and weren’t in situations that required us to communicate about planning for our future. We had great communication skills before, but moving in has only helped with this, and instilled in us this sense that we are a “we”—a “two for the price of one” sort of mentality. We plan our travels, social schedules and free time together more now that we are living with each other instead of living with friends. 4. Small tiffs will happen. Let’s be honest, honeymoon phases and sugar-coating aside: When two people who have never lived together before begin to cohabitate, there are bound to be disagreements and learning curves along the way. It’s not a bad thing though! Getting better at speaking up, strengthening our communication, and becoming better listeners are all positive results we can both say we’ve had since moving in together. There’s nothing productive about sweeping things under the rug if something’s bothering one of us, and living together provides neutral ground in a shared space to work out disagreements. Meaning, living together has helped us to both speak our minds and communicate openly and respectfully, even better than we used to. 5. It’s the best thing ever. Since moving in, I still enjoy having my alone time when I need it. But, our time spent together—especially on the weekends, with no plans on the calendar—is even better. This chapter has been my very favorite of ours so far. It is essentially having a sleepover with my favorite person on the planet every night! There are bound to be ups and downs, but how we navigate them is what’s most important. No relationship is perfect, and sometimes changes in that relationship aren’t necessarily a smooth transition. But if you find the person you truly want to be with, being able to spend more time together is quite simply the best thing ever. What have you learned since moving in together?